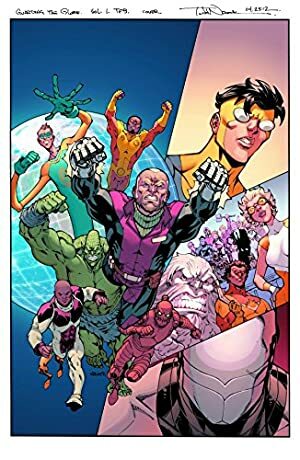 Yet is a minor super-hero by Skybound, the publishers of the Invincible and Guardians of the Globe comics. He first appeared in 2010. Known Relatives: Unnamed Mother and Father. Base Of Operations: Guardians of the Globe Headquarters, Utah, USA; formerly Nepal wilderness. Height: 11’0” Weight: 2000 lbs. 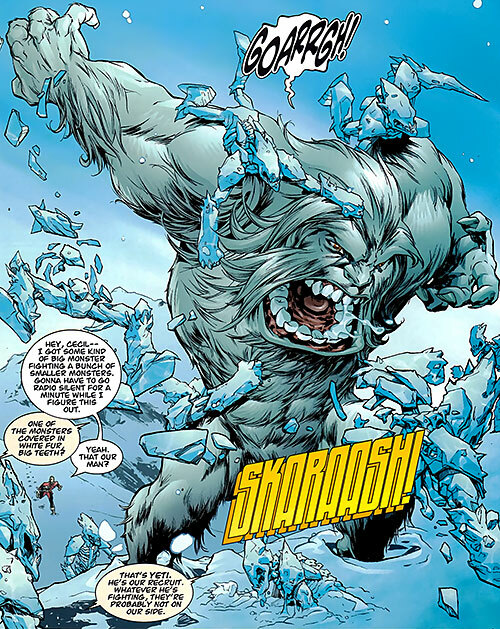 Yeti possesses the typical strength that can be expected from a Frost Giant youth of his general size, age, height and weight. He can lift (press) at least one hundred tons directly overhead. Yeti is still extremely immature and nowhere near his full growth, since he is a mere 12 years old. It is expected that his strength will increase dramatically when he has achieved physical maturity. 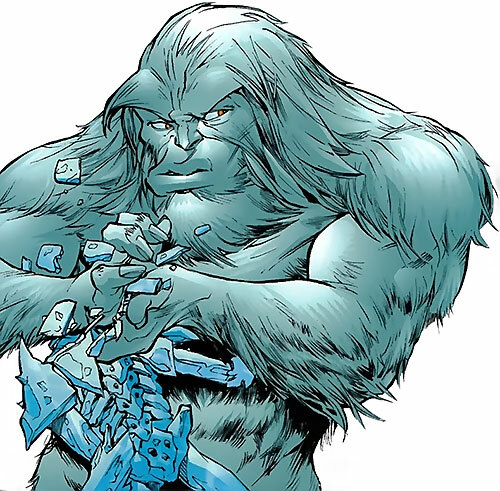 Like all Frost Giants, Yeti is superhumanly strong and durable. He is also capable of resisting extreme lows in temperature which would physically incapacitate a human being. His sense of smell is presumably superhumanly acute as well. However, he has never overtly displayed this ability. Yeti broke his people’s long standing tradition, by actively interacting with the world of man from a very young age. He battled threats to humanity across Asia for nothing more than the pleasure of doing the right thing. During his travels he heard stories of the American super-heroes and became fascinated by them. Wanting nothing more than to meet them and join their numbers, Yeti reached out to the American government. He inquired about gaining membership to the government sponsored team, the Guardians of the Globe. Fortunately for Yeti, the Guardians decided to expand their roster and sent Brit to recruit him. 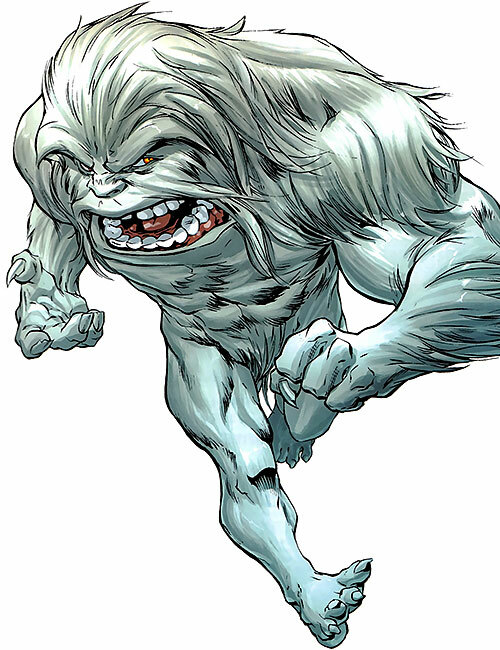 Yeti participated in several successful adventures alongside the Guardians. His raw strength and imperviousness to harm made him one of their strongest members. Unfortunately for Yeti, his parents eventually came looking for him. As it turned out he had not asked permission to leave Nepal when Brit came recruiting. Thus, he had in essence become a runaway. When Brit realized that Yeti was nothing more than a child, he removed him from the active roster. Heart-broken, Yeti returned to Nepal with his parents. 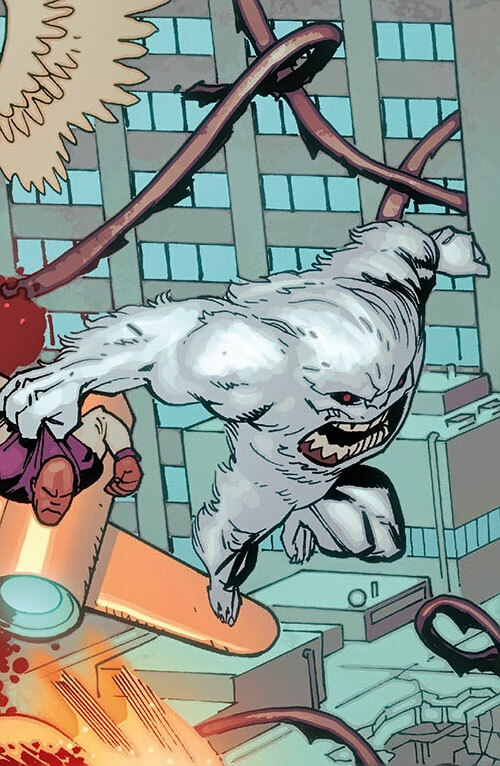 Yeti rejoined the Guardians at that point and has continued to be a member of good standing since then. Yeti appears to be a massive, hirsute, bipedal male. His shaggy pelt, which covers his body from head to toe, is stark white. Though Yeti is extremely tall by human standards, he is minuscule in comparison to his parents and other members of his species. Before he reaches physical maturity, he can expect to add over 90 feet in height and many thousands of pounds in weight to his frame. Yeti’s eyes are blood red and he has three fingers in addition to an opposal thumb. His face appears to be too large for his massive body, and hangs low enough to obscure the pectoral region of his chest. His jaw is so massive that a full grown man could crawl within it when it is open to it’s maximum. Yeti doesn’t wear clothing of any sort. His pelt provides him all of the protection that he needs from the elements while simultaneously protecting his modesty. 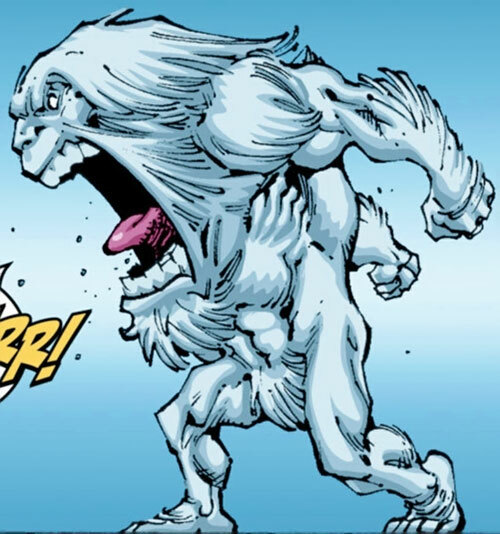 Yeti is essentially a great big kid whose thirst for adventure and new experiences overrides his common sense. Fortunately for him, his raw physical power normally makes up for it. Density Increase and Growth are Always On and are Figured into the above stats(-1FC). Area Knowledge (Wilderness of Nepal), Credentials (US Government), Expertise (Wilderness Survival [Cold]), Language (Tibetan). Guardians of the Globe (High), Abominable Snow People (High). Age (Young, amongst Snow People only, 0 pts), Innocent, Miscellaneous (Cannot Swim), Strange Appearance. Writeup completed on the 4th of August, 2013.